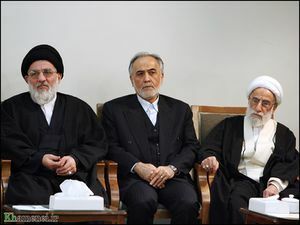 Left to right: Ayatollah Hashemi Shahroudi, Parviz Davudi, and Ayatollah Ahmad Jannati. Ayatollah Mahmoud Hashemi Shahroudi (born in 1948 in Najaf, Iraq) is the current--as of 2007--head of the judiciary of the Islamic Republic of Iran. He was appointed to the post by Grand Ayatollah Ali Khamenei in 1999. During a meeting with Indonesian clerics in July 2007, Ayatollah Shahroudi said that extremism threatens Islam. "Iran calls for joint market with Senegal", Press TV (29 Jul 2007). This page was last edited on 30 July 2007, at 20:40.